When I first really started studying the history of comic books in my late teens and early twenties, I recall there was some debate about what was the first graphic novel. The two candidates were Will Eisner's A Contract With God and Jim Steranko's Chandler: Red Tide. Eisner tended to be favored because it had the words "graphic novel" squarely on the cover and, well, it was Will Frickin' Eisner. Steranko's book, however, did get published two years earlier, though the term was "hidden" in the introduction. And there was also some question as to whether Chandler really was a graphic novel or just a novel with illustrations. But that turned out to be a matter of semantics. Because the first REAL graphic novel came out in 1950 and was seductively titled It Rhymes with Lust. It wasn't called a "graphic novel" specifically, but the "picture novel" was otherwise everything you'd think a graphic novel would be. Writer Arnold Drake later recalled that he and co-writer Leslie Waller thought of the idea of "a more developed comic book — a deliberate bridge between comic books and book books" a year earlier in 1949. 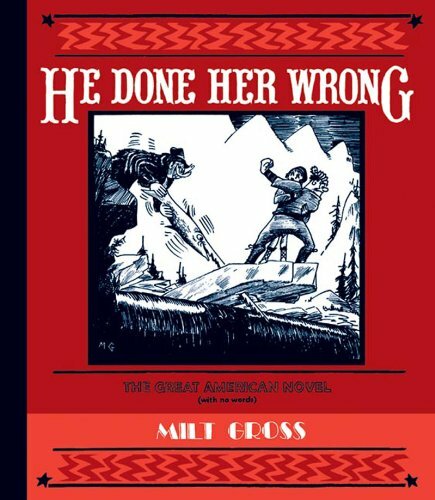 Then, a few months ago, I discovered Milt Gross. 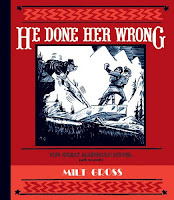 He authored a book in 1930 called He Done Her Wrong. It was subtitled "The Great American Novel, and Not a Word in it. No Music, too." Gross was a cartoonist and drew the wordless novel as something akin to a silent movie of the time. Clocking in at just shy of 300 pages, it really was a graphic novel. Except that Gross was basing his work on that of Lynd Ward, who had done a graphic novel entirely out of woodcut engravings a year earlier. Gods' Man was clearly a story told in a sequential art format, and has been republished many times. Except that Ward noted Flemish painter Frans Masereel as an influence. Masereel published several wordless novels told in woodcuts throughout the 1920s. Many of those are still being published today. In many respects, this ongoing debate isn't new. Obviously, people have been able to trace this line of influences and predecessors within comicdom. And we're talking about published novels that were commercially available, not obscure pieces of original art hanging in various private collections. So this "news" really isn't. But I find it fascinating that some of these names haven't permeated the broader comics culture just yet. It seems limited to a few more academic circles. Does it matter than Masereel's work doesn't LOOK like what we might currently think of as a graphic novel? It was done as woodcuts, not illustrations, and doesn't have word balloons. But wasn't Shaun Tan's The Arrival embraced by the comic community? They're not woodcuts but they're still fairly monochromatic and have a distinctly different look than most comics. Not that different than Masreel's or Ward's books, really. I'm not about to put my foot down and say Masreel's first book, De Stad, is the first definitive graphic novel, but it seems to me that comics folks at large should know a little more history of graphic novels than just stopping when they get to 1950.